"I don't even know I'm old. I still feel young," Ann Crumby told the station. "I don't feel no different than I did [than] when I was 101," added Gussie Crumby, noting that she and her sister always make sure to be together. "When I look around, I see her and when she looks around, she sees me." 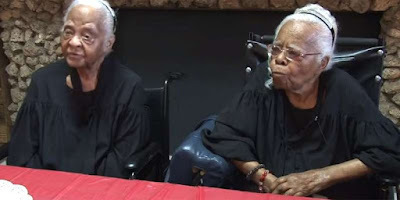 The twins were born in 1916 and raised by their grandmother in Hancock County, Georgia, southeast of Atlanta, where they grew up on a farm, worked on the field and went to "a little school" with only one teacher, they told WMAZ-TV. Both became seamstresses, with Ann moving to New York when she got married, and Gussie staying closer to home with her husband. They lived apart for decades, but reunited in the late 90s, and since then, "we haven't been apart so much," the women told the station. Twins, like the Crumby sisters, may have a better chance at living longer than the rest of us, a recent study found. Their close social bond protects against risky behaviors, provides emotional support during stressful times and promotes healthy behaviors similar to the "marriage protection effect," which finds married adults are healthier than singles, the researchers from the University of Washington noted. Identical twins had the edge over fraternal twins, and fraternal twins had the edge over the general population, the 2016 study — based on data from the Danish Twin Registry — found. Male twins received an especially big benefit. But you can still live a long life without a twin by your side. The vast majority of people are built to live to around 89 if you're a woman, and 86 if you're a man, said Dr. Thomas Perls, director of the New England Centenarian Study and professor at the Boston University School of Medicine. Getting to your late 80s is probably about 80 percent behavioral, he added. That means keeping fit, eating a vegetarian diet, avoiding cigarettes and alcohol, managing your stress can help you reach your full longevity potential. But living to 100 and beyond is mostly about having the right combination of "aging well" genes.